The Zinedine Zidane to Manchester United stories just won’t go away at the moment, with growing talk of transfer targets the former Real Madrid boss could try to sign for the Red Devils. CaughtOffside have been told Zidane has spoken to United duo Paul Pogba and Anthony Martial about expecting to receive an offer to replace Jose Mourinho in the near future after the team’s poor start to the season. On top of that, sources close to the Frenchman have also told CaughtOffside that Zidane has approached Antoine Griezmann as a potential transfer target if he moves to Old Trafford. 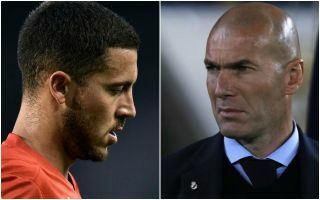 The Daily Mirror have since added big names like Toni Kroos, Thiago Alcantara, James Rodriguez and Edinson Cavani as players Zidane would like to sign for United, but there’s one big name missing from all the speculation at the moment: Eden Hazard. This, however, would be a transfer raid that makes sense for United under Zidane for a whole host of reasons – so much so that if the deal does happen soon it’s one we’re bound to hear more about. First up, let’s not forget the Belgian playmaker has spoken openly about his admiration for Zidane, who was a similar style of player to himself at the peak of his powers. ‘Everyone knows the respect I have for Zidane as a player, but also as a manager. He was my idol,’ Hazard told RTL, with translation from the Telegraph, less than a year ago. Far from just being a marquee signing for the sake of it, Hazard would actually be an ideal purchase for MUFC if the deal could happen soon. The team looks blunt in attack right now, with Alexis Sanchez struggling to settle since his January move from Arsenal, and the team starved of creativity with Paul Pogba not fitting in and Juan Mata past his peak years. Further forward, Hazard could also be an ideal upgrade on inconsistent youngsters Anthony Martial and Marcus Rashford. As already noted, Griezmann and Rodriguez are among Zidane’s targets, so why not a potentially cheaper, and arguably better, player in Hazard? On top of all this, let’s not forget the 27-year-old looks no closer to signing a new contract at Chelsea, with his current deal due to expire at the end of next season. The Blues were unable to keep hold of Thibaut Courtois this summer as they were similarly close to losing him on a free, and that resulted in him moving to Real Madrid on the cheap. Don Balon continues to link Hazard with Real Madrid as well, so it could be that the Belgian’s preference would be to move to Spain, but this contract situation surely gives United big hope of signing him for a bargain price. The Red Devils are hardly shy of raiding their rivals if the opportunity arises, having poached Sanchez from Arsenal in a similar way last winter, while Nemanja Matic and Mata are also among players to move directly from Stamford Bridge to Old Trafford. It’s just fantasy for the time being, but if everything falls together there looks to be a real opportunity for United to seal the ambitious transfer of Hazard in the near future, and that should be a big worry if you’re a Chelsea fan.